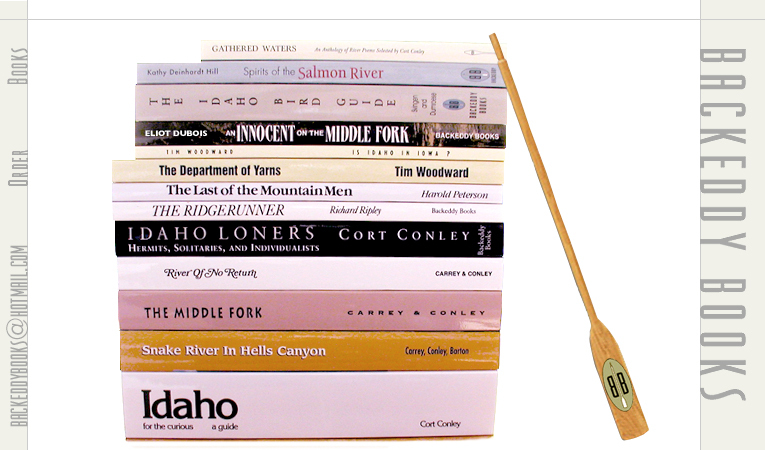 Established in 1976, Backeddy Books is a small regional publisher printing nonfiction titles, largely about Idaho, and for 36 years was located in Cambridge, a town in western Idaho that serves as gatepost to Hells Canyon. The business has moved downstream to Boise. Backeddy Books accepts WHOLESALE and RETAIL Orders. Whosesalers should e-mail manager for details. check order sheet for availability. PayPal payments and checks are accepted. Copyright © 2000 Backeddy Books Inc. All rights reserved.